Think you're the biggest football fan? 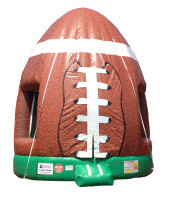 Prove it with our Football Bouncer rental. This massive pigskin is the perfect place to recreate your favorite plays of yesteryear while proving to the neighborhood you and your family are the biggest football fans around.